An artist's impression of the Aeolus satellite orbiting above the Earth. 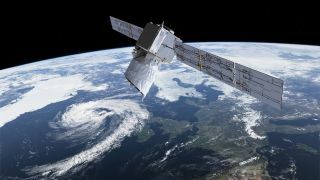 Europe will launch a new weather satellite today (Aug. 22), and you can watch the launch live online. The Aeolus wind-mapping satellite will lift off from the Guiana Space Center in Kourou, French Guiana, at 5:20 p.m. EDT (6:20 local time, 2120 GMT), riding atop a Vega rocket provided by the European launch service Arianespace. Aeolus was originally scheduled to launch Monday (Aug. 21), but Arianespace postponed the launch by 24 hours due to unfavorable weather conditions. You can watch a live webcast of the launch starting 15 minutes before liftoff here on Space.com, courtesy of Arianespace, or directly from the European Space Agency. If all goes according to plan, the Aeolus satellite will separate from the Vega rocket's upper stage 54 minutes and 57 seconds after liftoff. The rocket will place Aeolus in a sun-synchronous orbit approximately 200 miles (320 kilometers) above the Earth. "Specifically, Aeolus will follow a 'dawn/dusk' orbit, appearing to follow the borderline between sun and shade, day and night on Earth, meaning its solar panels will always receive the same amount of light from the sun," European Space Agency (ESA) officials said in a statement. Once it's in orbit and deemed fully operational, the Aeolus will spend three years mapping Earth's winds. It is the first satellite designed to study wind patterns on a global scale. To do this, it will use a Doppler wind lidar — a big, complex laser instrument called Aladin. The Arianespace Vega rocket, with the Aeolus satellite on top, stands in the launch tower at Europe’s spaceport in Kourou, French Guiana. Aladin works kind of like a radar, but it uses beams of light rather than radio waves to measure wind speeds. "Aeolus will probe the atmosphere with pioneering ultraviolet laser pulses, which will enhance the understanding of tropical dynamics and processes relevant to climate variability," according to Arianespace's description of the mission. The satellite will probe the lower layers of the atmosphere, down to an altitude of about 19 miles (30 km), "to yield vertical profiles of the wind and information on aerosols and clouds," and those measurements "will improve our understanding of how atmosphere dynamics work and contribute to climate change research," ESA officials said in a statement on July 6. The satellite was named after the Greek god Aeolus, who was known as the "keeper of the winds" in Homer's epic poem the "Odyssey." The Aeolus mission has an estimated cost of $560 million (481 million Euros), according to IEEE Spectrum.